Team & Task Organizer For Magento allows you to schedule, organize and manage tasks which should be done by you and your employees. The extension enables adding, editing and removing tasks, as well as assigning them to particular staff members. 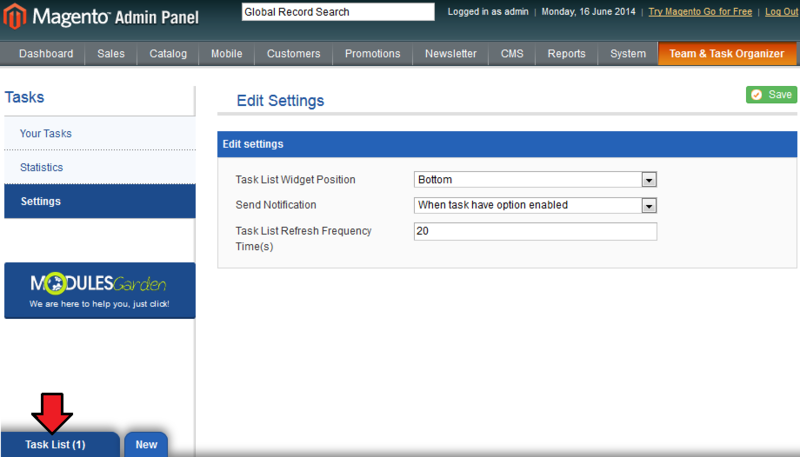 All these and much more in a convenient admin panel widget. In addition, the extension offers the possibility to schedule auto tasks that will be created upon occurrence of a specified event. This tutorial will show you how to successfully install Team & Task Organizer For Magento. 1. Log in to our client area and download Team & Task Organizer For Magento. 3. 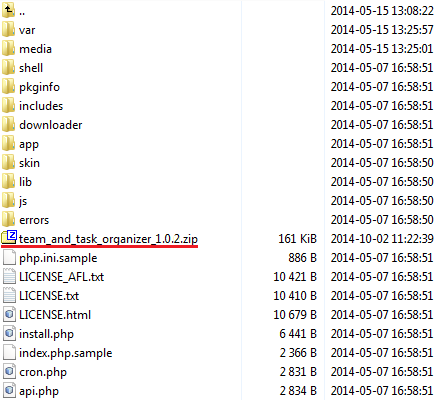 When you install Team & Task Organizer For Magento for the first time you have to rename 'license_RENAME.php' file. File is located in '/app/code/community/Modulesgarden/Teamandtaskorganizer/license_RENAME.php' . Rename it from 'license_RENAME.php' to 'license.php' . 5. Now you have to clear cache at your Magento system. Log in to the Magento and go to the 'System' → 'Cache Management' . Press 'Flush Magento Cache' and 'Flush Cache Storage' . Afterwards, relog in to the system. 6. 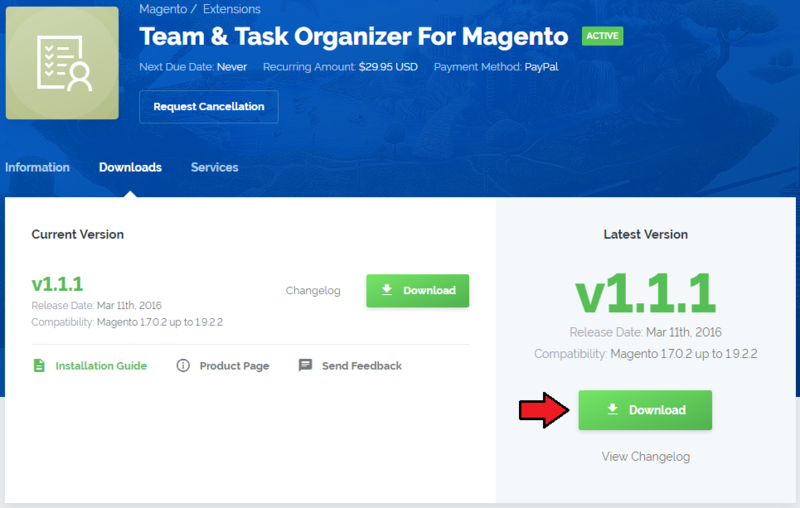 You have just successfully installed Team & Task Organizer For Magento! Team & Task Organizer For Magento allows you to easily manage your team, automatize creation of tasks upon defined events and manage all existing tasks. In order to view list of tasks assigned to you, proceed to the 'Team and Task Organizer' → 'Your Tasks List' . All information concerning your tasks can be found here. In addition, you can perform various actions on your tasks, such as adding a comment, editing it or even removing it completely. 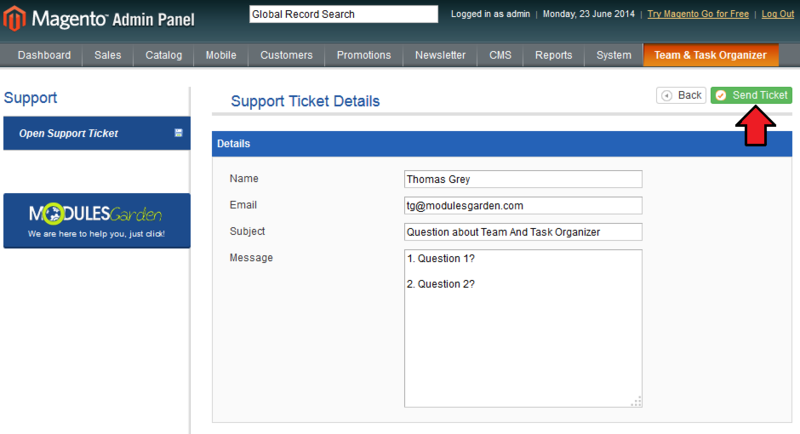 To improve it even more, we added a possibility to filter tasks using form marked on the following screen. You can easily create new tasks, press 'Add New' to proceed. 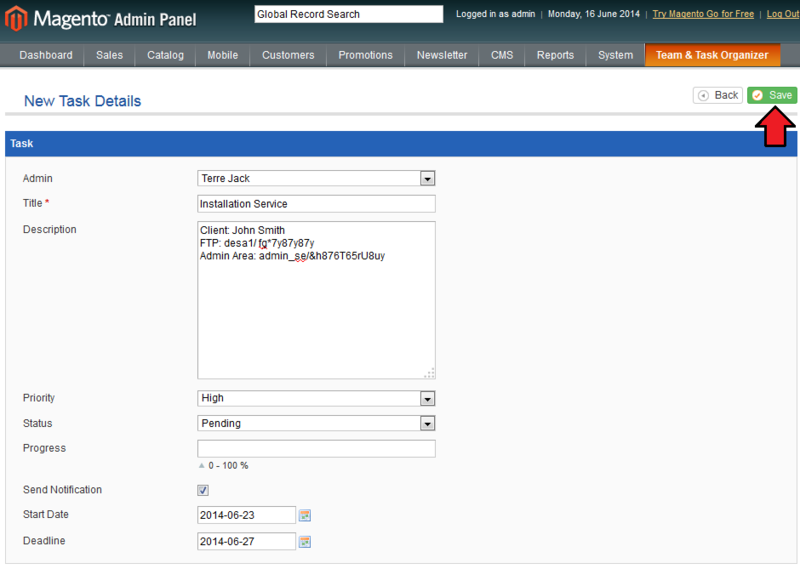 On the following screen you can see how a new task for admin Jack Terre is created. This task concerns important installation service for client John Smith. After filling in all fields, press 'Save' to create this task. 'Statistics' page allows you to view statistics of task sorted by status and priority. You can also view list of tasks which are currently in progress. At the 'Settings' tab you can define behaviour of our extension. 1. Defines position of widget in your Magento admin area. 2. Defines actions for which notification will be sent to admin via email. 3. Time between refreshes of the widget. 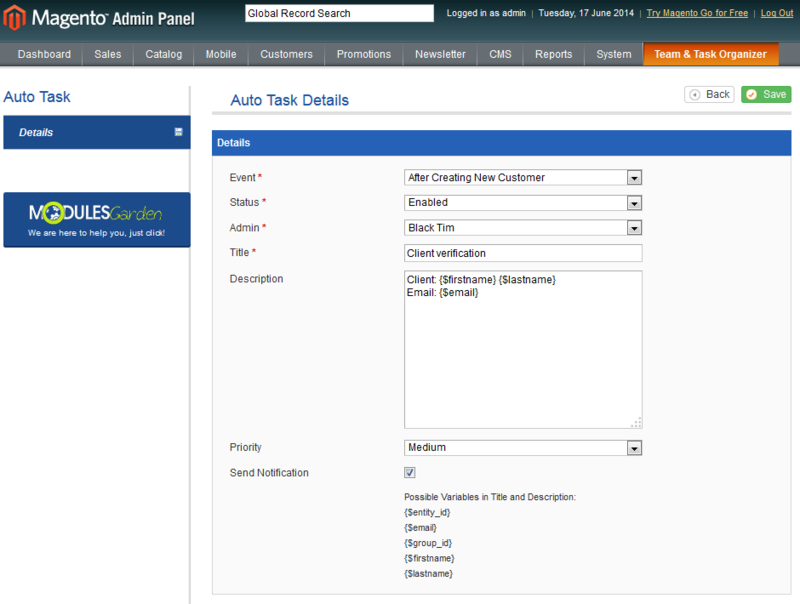 You can access Task List widget from any place of your Magento admin area. Press 'Task List' as shown on the following screen to unfold it. Here you can see information about your current task. In addition, you can easily change its status using buttons in 'Action' column (red). You can even access comments made to this task using 'Comments' button (green). At the admin control panel you are able to view list of all tasks, set up privileges to your admins and even set up auto tasks. You can access list of all tasks under 'Admin Control Panel' → 'Tasks List' . It is similar to the 'Your Tasks List' page. The only difference is that it shows all existing tasks instead of your tasks only. Our extension allows you to set up privileges of your admins for actions made inside of the extension. 'User Privileges' page can be accessed under 'Admin Control Panel' → 'User Privileges' . In order to set up privileges to one of your admins, press 'Privileges' next to her/his email address as shown on the screen below. User privileges are divided into three parts. First of them contains the most crucial permissions. 1. Allows to create a new task. 2. 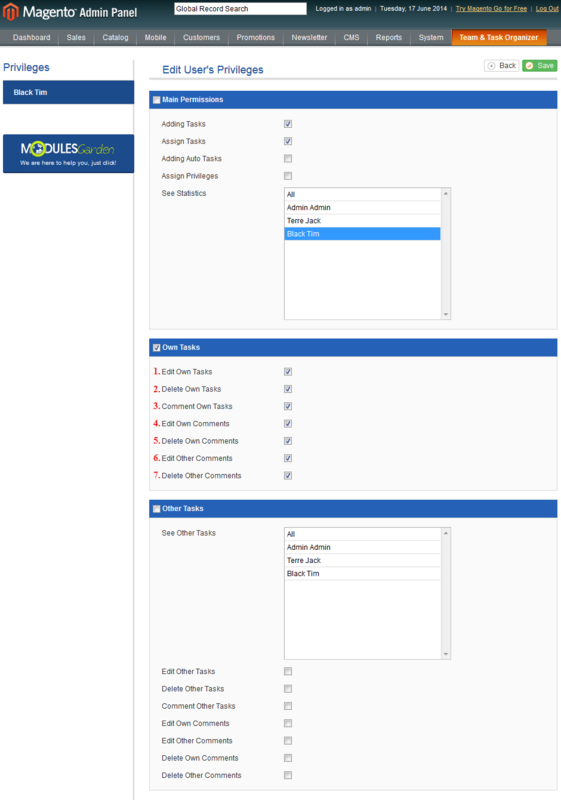 Allows to assign created task to any admin. 3. Allows to create a new automatic task (automatic task creation upon defined events). 4. Allows to assign privileges to admins. 5. Defining admins for whom statistics will be displayed at the 'Statistics' page. Admins permission shown on the following screen allows to create task for any admin and view statistics that concerns the particular admin only. Second part concerns tasks assigned to admin himself. 1. Allows to edit own task. 2. Allows to remove own task. 3. Allows to add comments to own task. 4. Allows to modify own comment. 5. Allows to remove own comment. 6. Allows to modify other admin comments left on admin task. 7. Allows to remove other admin comment from admin task. Privileges shown below allow the admin to fully control his own tasks. 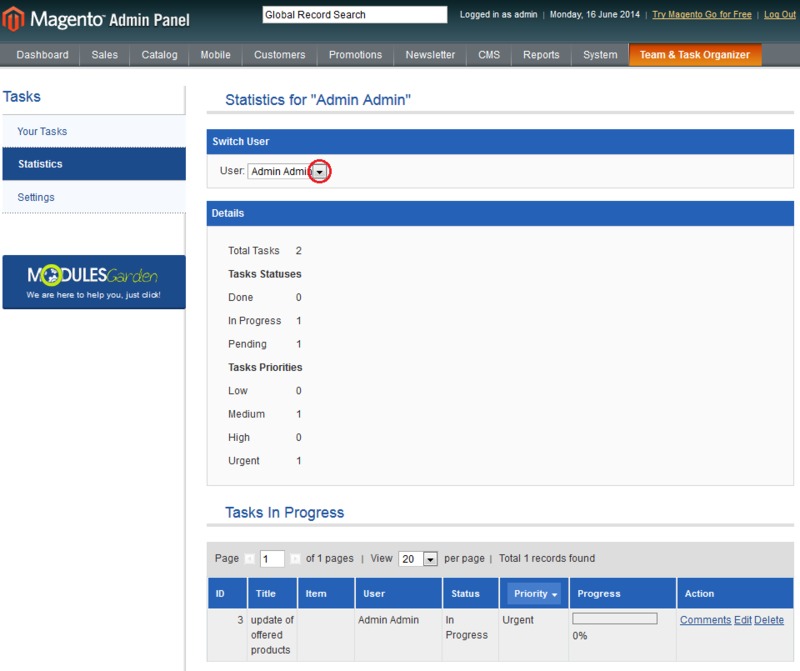 At the third part you can set up privileges regarding tasks of other admins. 1. Defines task of other admins visible for admin you are setting privileges for. 2. Allows to edit task of other admin. 3. Allows to remove task of other admin. 4. Allows to add a comment to other admin's task. 5. Allows to edit own comment at other admin's task. 6. Allows to edit other admin comment at other admin's task. 7. Allows to remove own comment from other admin's task. 8. Allows to remove other admin comment from other admin's task. Admin with privileges shown below can modify tasks of other admins, but is unable to remove anything. Auto tasks allow you to set up creation of desired task upon defined events. 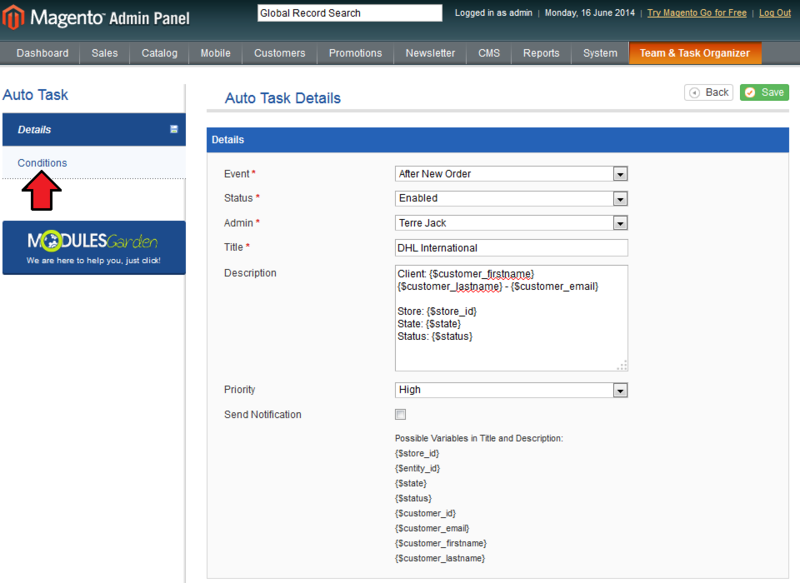 Proceed to 'Admin Control Panel' → 'Auto Tasks' and press 'Add New' to create a new auto task. Let's fragment it down into its individual parts and describe each of them separately. For purpose of sample, we will create auto task, which will be triggered after creation of a new user. It will create a new task 'Client verification' assigned to Tim Black, have medium priority and contains details of client. Event - defines event upon which task is created. Status - enable/disable this auto task. Admin - new tasks will be assigned to him. 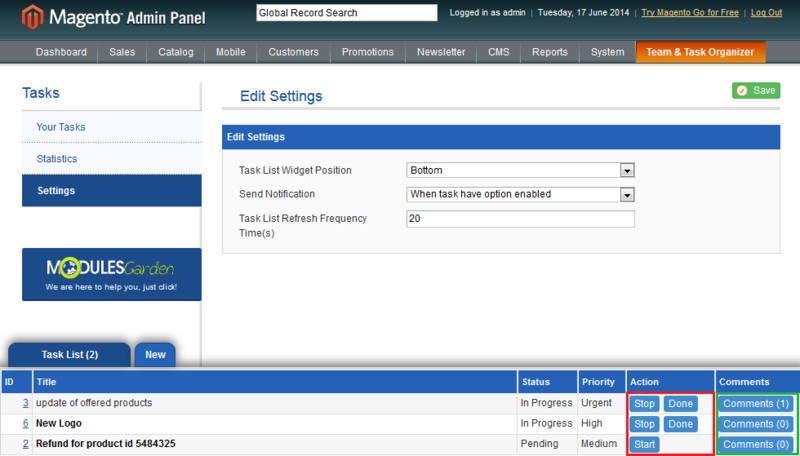 Description - description of created tasks, uses variables marked on the following screen. Priority - priority of new tasks. Send Notification - if marked, it will send an email upon task creation. Team & Task Organizer For Magento allows you to do even more owing to conditions functionality. Note: This version allows you to set up conditions to 'After New Order' event. You can edit any bold text through pressing it and choosing desired value. Press '+' to add new condition and 'x' to remove existing one. Conditions shown on the following screen will create task only if client chooses DHL International Express shipment method and total value of order twhich is greater than 100$. Press 'Save' to confirm conditions or 'Delete' to remove auto task. 1. You can easily open a ticket and ask us about your extension. Simply, go to your extension → 'Open Support Ticket' page, fill form and press Open Ticket' button. 2. Error 'The page you requested was not found, and we have a fine guess why.' encountered while choosing 'Shipping method' condition. 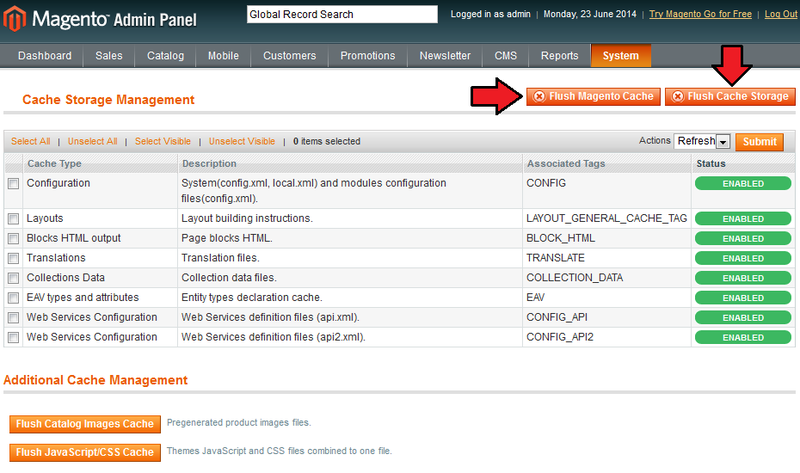 Reason: This is related to Magento bug with missing DHL configuration variables. Solution: To solve this please go to 'System' → 'Configuration' → 'Shipping methods' → 'DHL' and save the configuration. 3. In case of any problems with the extension, that were not mentioned in this article, proceed to Common Problems With Magento Extensions article. This page was last modified on 14 March 2019, at 14:45. This page has been accessed 17,736 times.